I sit here, whizzing along side the 401 enroute back to Toronto, unable to stop thinking about this past weekend. Not only did I get to spend a festive holiday evening with some of my favourite ladies, but I got to watch one of my dearest friends get married (not to mention gain a fabulous new lady friend along the way). Weekends like this don't happen often, and when they do, one has no choice but to jump in, and do your absolute best to soak it up and cherish every moment. The wedding, and overall simcha of the weekend, was the perfect precursor to Chanukah. 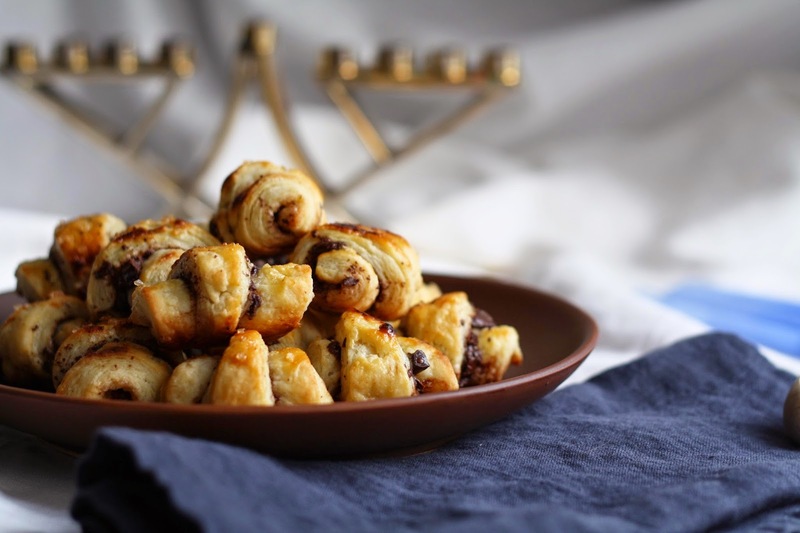 Tuesday marks the first night of Chanukah, and in anticipation of candle lighting, gift giving, and copious amounts of latke eating, I decided to try my hand at something new -- rugelach -- a Jewish pastry, and distant relative to the French croissant. 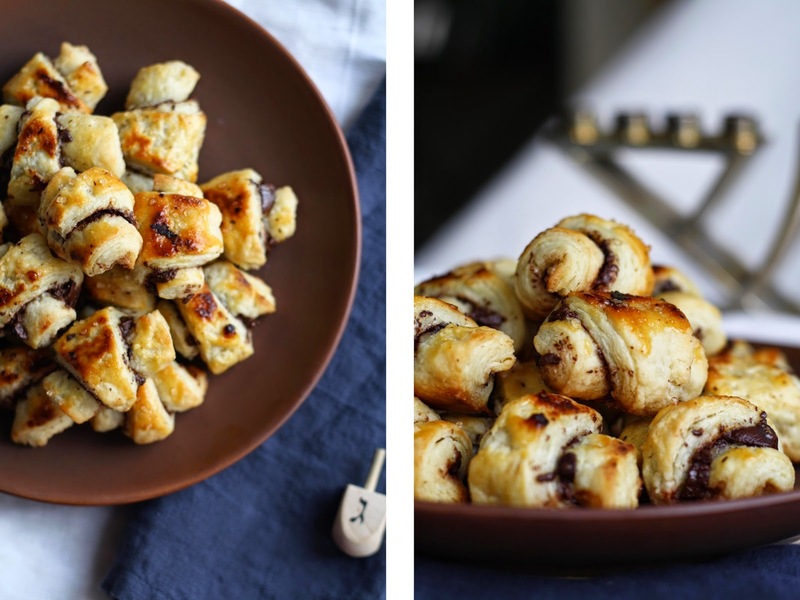 Rugelach proved to be one of the more time consuming things I've baked in a while, but the result was well worth the effort -- perfectly flaky and chocolately in all the best ways -- ideal for any celebration. Combine the flour and butter in the body of a food processor fitted with the s-blade. Pulse until the mixture resembles a coarse sand. Transfer to a large bowl and add the salt, cream cheese and sour cream. Use your hands to work everything together, breaking up the cream cheese into small pea-size amounts. Work quickly so the cream cheese doesn't melt (this step is definitely not glamorous, cream cheese to the fingers was a whole new sensation, just go with it and you'll be fine!). Lay a piece of tin foil onto the counter. Transfer the dough and press it into a large disk. Wrap it into the tin foil, and refrigerate for 1 hour. 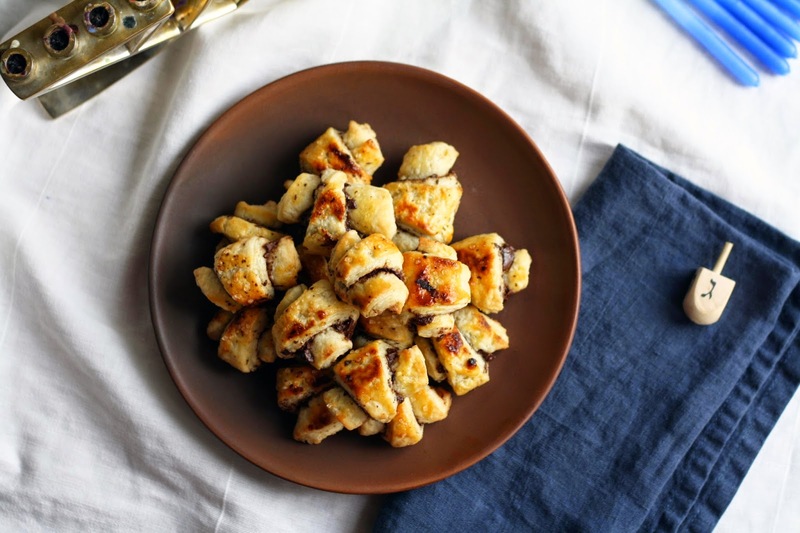 While the dough is chilling, make the chocolate fillings. In a small bowl, combine the sugar and cinnamon. Finely chop the chocolate and melt the butter. Set everything aside. Preheat the oven to 350 and line 2 baking trays with parchment. Flour a surface on the counter. Unwrap the dough and divide it into 2. Place half on the floured counter, and re-wrap the other half and transfer it back into the fridge. Manhandle the dough a bit, ridding it of any cracks. Add flour as you go. 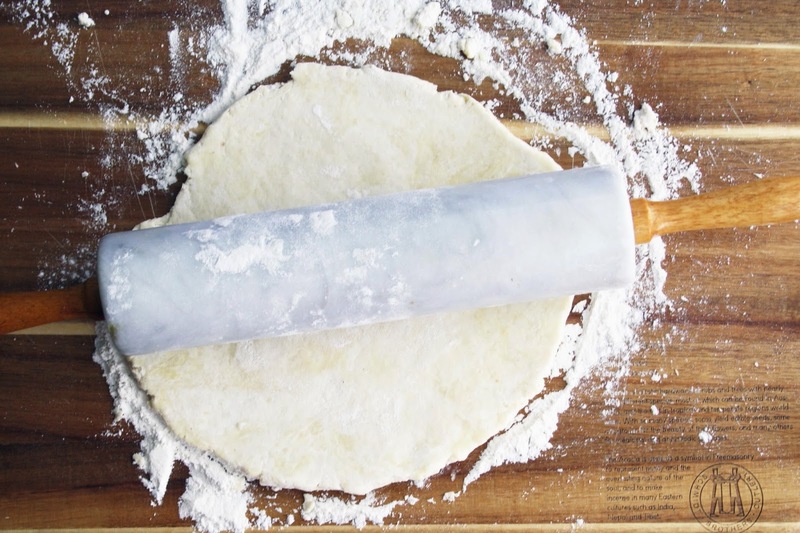 Roll the dough into a ball, press down slightly to flatten, and then using a rolling pin, roll it into a 10"-12" circle of equal thickness. You want the dough fairly thin, so adjust the size of your circle accordingly. Using a pizza slicer or sharp knife, trim the edges of the circle to create a smooth, clean edge. Brush the dough with melted butter. 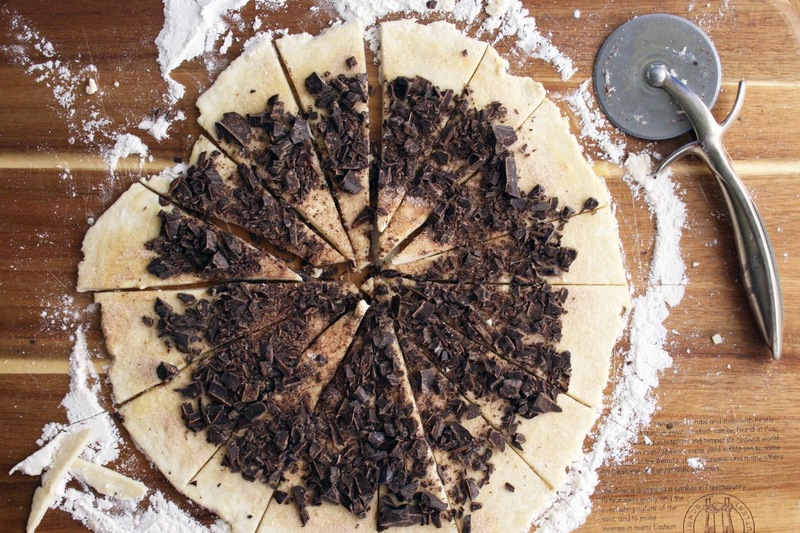 Evenly sprinkle the cinnamon sugar mixture across the dough, and then top with chocolate - leaving a 1" border. Gently press the chocolate into the dough. Use the pizza slicer to cut the dough into roughly 16 equal wedges. Starting from the wider edge, carefully roll towards the centre, squeezing a bit as your go to secure the shape. 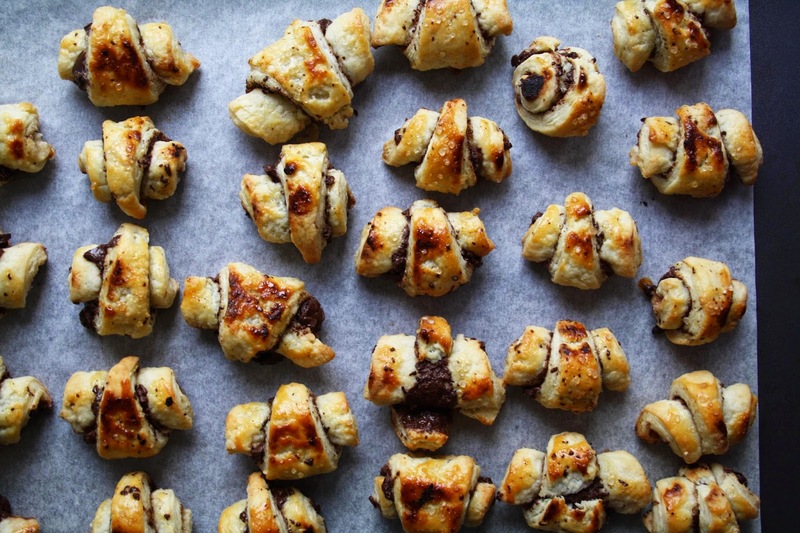 Place the rugelach seam side down on the prepared baking sheet. Repeat with the remaining wedges, and the second refrigerated piece of dough. Brush each piece with a light egg wash, and sprinkle with coarse sugar. Bake for 20-25 minutes, until golden brown, rotating the pan halfway through. Allow to cool completely before moving, or eating.